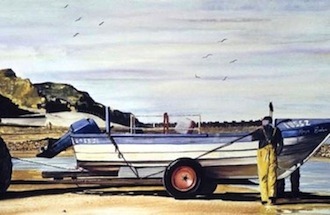 If you were asked to give a description of the painting above, you might first mention the subject matter – the boat, the man, the birds, the location, etc. Then you might describe the range of colours in the picture and their brightness. Or the picture’s composition, the balance of detail versus blocks of colour. Or the shapes and angles, the verticality or horizontality, the use of lines and curves. You probably wouldn’t begin by asking yourself if it was painted right-handed or left-handed. Or if the artist held the brush between thumb and extended index finger, like a pen, or with the hand in a fist shape, with the thumb on top. Or whether the artist’s fingers or wrist were more active, or the whole arm. Phonetics, for a lot of people, is mainly about questions like those in the second paragraph: less about describing speech sounds than about describing body movements which may have produced them. So “sounds” are depicted with cross-sectional diagrams of the head, or as lip and tongue movements, or by means of a phonetic alphabet each of whose letters is intended as an abbreviation for an articulatory description. Of course the body movements involved in speaking are a valid and intriguing object of study, like the body movements involved in painting, or in drawing, or in writing. But I don’t think they should be the main, still less the sole, focus of attention in phonetics. I didn’t really become aware of this until the mid-late 1980s, when I was working on a speech technology project at UCL under Adrian Fourcin. It was through invaluable discussions with Adrian – now Emeritus Professor of Experimental Phonetics – that I grasped the prime importance of perceptible “speech patterns” and the fundamental asymmetry between the auditory-acoustic and the articulatory branches of phonetics. It’s obvious that we don’t learn to write before we learn to read: we learn the visual patterns first, then how to produce them. But in phonetics the articulatory bias is so widespread that it’s worth pointing out that the same is true of speech. 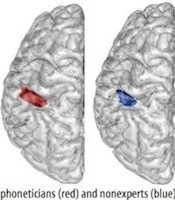 In language acquisition, perception seems broadly to precede production: we learn to articulate in order to produce the auditory-acoustic speech patterns which we have already heard and stored in our mind’s ear. This is why the prelingually deaf generally don’t acquire normal speech articulation, while normal speech perception is possible for those with motor deficits. 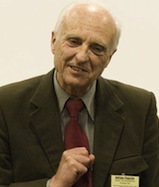 It’s obvious that normal speaker-hearers can perceive speech correctly without simultaneously speaking, but crucially we’re not able to speak correctly without simultaneously hearing: the speech of those who lose their hearing rapidly suffers, and most of us have noticed how headphone-wearers instantly and unwittingly raise their voices – because auditory guidance is so crucial for good articulation. 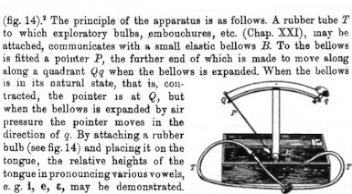 The great phonetician David Abercrombie declared that “Speech may be said to consist of movements made audible” – a classic statement of the articulatory view. But this makes speech a sub-field of kinesiology, and draws attention away from the central fact that speech sounds are communicative signs. The primary object of study, it seems to me, is the signs rather than whatever movements produced them (although of course the movements have great interest in their own right). Overall, my time on that speech technology project was rather dispiriting. My end of things, phonetics and phonology, seemed to have disappointingly little to contribute to the synthesis and recognition of communicative signs – Adrian’s speech patterns. Phonetics and phonology were skewed towards articulatory descriptions; indeed, they seemed to be becoming more articulatory than ever, the latest trends back then including “feature geometry” and “articulatory phonology”. If speech synthesis had focused on building artificial mouths rather than generating audible speech patterns, it would probably still be stuck at the stage of flying machines with flapping wings; Stephen Hawking and others may well have been doomed to silence. Nonetheless, robot articulators (like ornithopters) are fascinating and good fun to watch. Likewise, artificial speech recognizers – the sort of thing used to provide captioning for the deaf when transcription by humans is impractical – would be non-starters if they required inserting a battery of movement-sensors into the speaker’s vocal tract, or needed the speaker to lie in an MRI scanner. Of course, technology – or rather lack of it – is one of the main reasons for articulatory bias. Today virtually everyone owns a mobile device for receiving and transmitting auditory-acoustic speech patterns, and the digital revolution has made the recording and analysis of sound signals cheap, quick and easy. But the great early pioneers of phonetics simply had no ready means to analyze sound. As recently (!) as my own student days, spectrographic analysis required cumbersome, expensive equipment that took minutes to analyze just a couple of seconds of speech, all the while producing noxious smoke as it burned the acoustic image onto special paper. 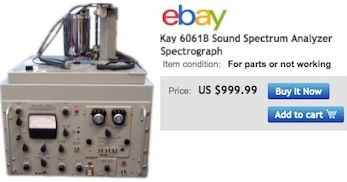 Auditory-acoustic analysis was the preserve of a few well-funded labs. It was an optional extra for the later chapters of phonetic textbooks, something to be covered in second-level courses to which the majority of students never progressed. The first-level courses dealt with head diagrams, tongue spaces, etc., and there arose, I think, a myth of relative articulatory simplicity: a notion that articulation is reassuringly well understood and easy to grasp, while auditory-acoustic phonetics dauntingly involves labs, white coats and maths. The problem with this myth is that it doesn’t compare like with like. The myth equates “articulatory phonetics” with the classification of speech sounds into linguistically relevant categories, e.g. “bilabial”, “voiced”, “rounded”; and it equates “acoustic phonetics” with instrumental measurement and quantification. This is a blunder on both counts. The Quadrant Indicator highlights several of the drawbacks that articulatory techniques have tended to suffer from. One is invasiveness: interference with the very articulation that is being studied. Another is the necessary presence of the speaker: we can analyze the acoustics of speech recorded a century ago, or of an abusive phone caller whose identity is unknown; but the articulations in question are completely inaccessible. Another drawback is staticness: many articulatory techniques deal best with steady-states, which is completely at odds with the fundamental fact that articulation is movement (though it dovetails reassuringly with the naivety of discrete written symbols). A further potential problem is that of health risks, which may be more serious than gagging on a rubber bulb. Concerns about radiation dosages put an end to the invaluable source of non-static articulatory data which was provided by x-ray movies. And yet another drawback suffered by many articulatory techniques is expense: while state-of-the-art acoustic analysis can now be done for free by anyone who can download software, a used MRI scanner might set you back $100,000 or more. The IPA is intended to be a set of symbols for representing all the possible sounds of the world’s languages. The representation of these sounds [sic] uses a set of phonetic categories which describe how each sound is made [sic]. It’s understandable that linguistically-relevant categories were given articulatory labels by “pre-acoustic” phoneticians. But it’s at least as important – arguably more so – to characterize these categories in terms of the auditory-acoustic patterns that we detect when listening to speech and which are the reference targets we aim to reproduce when we speak. The familiar articulatory labels can be misleading, not only because they reinforce the misconception of phonetics as essentially kinesiology, but also because they’re so often simplistic or inaccurate. My previous post, for example, tried to provide some acoustic substance to replace the simplistic and inaccurate articulatory view of vowels which is absorbed by successive generations of phonetics students and which continues to be encouraged by the IPA. Consonants, too, are widely considered to “be” the articulatory gestures which produce them. But a given speech pattern can generally be produced by a range of articulatory gestures. A particularly vivid example of this is the radically differing articulations which can be employed to produce the auditory-acoustic pattern of r-colouration: The question whether a given “r” was articulated with the tongue curled or bunched is not unlike the question whether a painting was done left-handed or right-handed: it’s not uninteresting, it may be detectable, it may even be of “forensic” relevance, but the distinction is not essential to what’s being signalled. Nor does a broad smile convert so-called “rounded” vowels into their “unrounded” counterparts. When we smile, as when we talk with a pen between our teeth, we adjust our articulations, keeping our speech sounds as close as possible to their auditory-acoustic targets. Likewise, the category “voiced” doesn’t equate to the vibration of the vocal cords. Languages don’t lose their so-called “voiced/voiceless” distinctions when speakers whisper. The auditory-acoustic patterns which embody these distinctions include characteristics of intensity, duration and spectral balance which survive in whisper. Like everyone else, I use terms such as “bilabial”, “rounded” and “voiced”. But as labels for phonological categories, these traditional articulatory names shouldn’t be taken too literally. From the phonetic point of view, they’re not the whole truth and often not the truth at all. Ventriloquists, of course, make a living by producing intelligible speech with scant regard for the IPA rulebook on “how each sound is made”. Technological history is probably not the only reason for articulatory bias. I suspect that a key factor is the relative importance of our senses, in particular the dominance of vision over hearing. It’s said that between a quarter and a third of neurons in the brain’s cortex are devoted to visual processing, compared with less than ten percent for touch, and only about two percent for hearing. 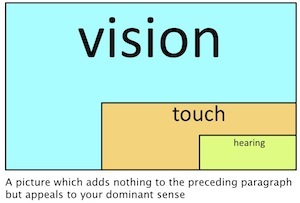 Metaphorically, understanding is widely equated with vision. We say “I see” or “I’ve got the picture” to mean that we understand. “Seeing is believing”, the phrase goes, while mere “hearsay” is unreliable. Out of sight, out of mind. Recording our visual impressions dates back tens of millennia to cave paintings and the like, but the first recording of any kind of auditory impression was much more recent. The first writing systems represented words as concepts rather than the way they sounded. When the first phoneticians tried to describe language in its specifically audible form, they unsurprisingly fell back on what they could see; the invisible resonances of the vowels, for instance, were represented as positions of the visible tongue. Note that the IPA does not use articulatory labels for its suprasegmentals section: if early phoneticians been able to get a better view of vocal fold articulation, we might now be referring not to high, low, rising and falling tones, but to stiff, slack, stiffening and slackening tones. (Halle and Ken Stevens proposed such terms as phonological features in the early 1970s.) After all, “stiff tone” and “slack tone” are no more silly as labels than “front vowel” and “back vowel”. A special case of visual bias is the according of higher status to written language over audible speech. This is even found when the writing in question is phonetic transcription. Occasionally I encounter what I call “paper phoneticians”, people who’ve learned to transliterate from normal English orthography to RP phoneme-letters without acquiring the ability to perceive or produce the relevant contrasts. They’ve learned to rewrite shell and shall as /ʃel/ and /ʃæl/ but they can’t hear the difference between the two words. All of us are “right”. Instead of quoting authorities, why don’t you just listen? I sympathize with both John and his questioner. Neuroscientists have presented evidence suggesting that the likes of John and me may be born with freakishly overdeveloped auditory cortices. For the general population, on the other hand, hearing phonetic distinctions is probably not so easy. In Abercrombie’s words, “their remarkable aptitude for copying speech sounds… has left most people not long after they have entered their teens. Certainly, fully-grown adults must be prepared to devote a great deal of labour and time to acquiring the pronunciation of a foreign language”. Prospective pronunciation students sometimes tell me that what they’re after is instruction on how to use their muscles; I’ve yet to have anyone ask for their ear to be trained – which is generally the more basic necessity. Of course I do make use of visual and and proprioceptive techniques. And there are linguistic contrasts which can be taught ‘articulation first’, e.g. making tooth-lip contact in v but not w, and alveolar contact in l but not ɹ. But such sounds are made with the lips and tongue-tip, the articulators most visible and most innervated by touch receptors. And language learners need to hear contrasts as well as make them. I’ve made ear-training tutorials and quizzes on vowels and tones precisely because these are the two major areas where vision and proprioception are of least use. Contrary to a widely held assumption, the sound of speech is as readily visualizable as its articulation; particularly when the all-important time dimension is taken into account. This is truer than ever today; but simplified visualized speech patterns have been around for decades. 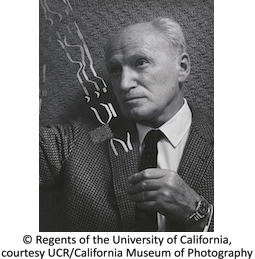 I recently came across a wonderful picture of phonetician Pierre Delattre taken in 1966 by the great American photographer Ansel Adams: The object held up by Delattre will be recognized by phoneticians as a transparency for a “pattern playback” synthesizer. This technique, pioneered by Franklin S. Cooper at Haskins Labs in the 1950s, aimed to home in on the most significant audible speech patterns by stylizing raw acoustic spectrograms into simple lines and dots that could be read directly by a light-operated synthesizer. To those with a relatively traditional phonetic background, this acoustic shorthand may be less familiar than head and tongue diagrams. But the basic auditory-acoustic speech patterns are as real now as they ever were, and it doesn’t require a lifetime in a white coat to start deciphering them. The three main horizontal stripes running through most of the picture are the lowest three resonances or “formants” of sonorant sounds. These formants are interrupted soon after the start by a rectangular scatter of dots, which indicates high-frequency frication; this reaches down to roughly the level of the topmost formant, which suggests that it’s ʃ (if it were higher up, it would be more likely to be s). Prior to this, the lower two formants begin quite close together, then whoosh apart: this suggests an aj-type diphthong, which makes the first syllable likely to be the first person pronoun I. After the ʃ, the lowest two formants again move towards each other, suggesting an open vowel. There’s then a silent interval, which suggests a voiceless stop; and the slope of the upper two formants on either side of this silent interval suggests that the stop is coronal, t. The utterance is unlikely to begin with anything as vulgar as “I shat”, so it’s probably American English “I shot”. which rather suggests that Delattre was posing for the camera with a famous line by the American poet Longfellow, “I shot an arrow in(to the air)”. The speech articulators are important and fascinating. They obviously contribute to phonological variation and change. An understanding of articulation is vital for speech therapy. Debate continues about the role that the motor system may play in speech perception. 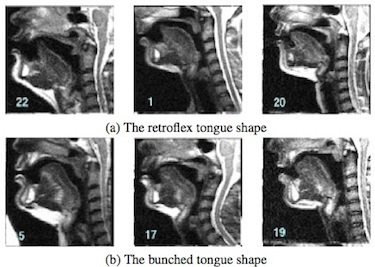 Adrian Fourcin himself has devoted much of his career to an articulatory technique, electrolaryngography, which I myself used in linguistic research. When I followed in Abercrombie’s footsteps, teaching phonetics at Edinburgh University, I did my bit to honour local traditions by having an artificial palate made and I found EPG displays great for teaching. But I think phonetics can do more to raise awareness of, and encourage sensitivity to, speech as sound – not just as positions and movements of the body. We should acknowledge and celebrate phonetics as the science of hearsay. I wonder what the tongue does to compensate for that. There are two issues: (a) how to teach students to acquire the sound system of any dialect (language); (b) how to teach teaches(coaches) who will later teach these students. Over the time, theatre departments have come up with many strategies for (b): for instance, students are trained in some technique like Linklater, Fitzmaurice, etc. Then, we have phoneticians like Ian Catford, who advises students to develop kinesthesia of articulators. Voice folks like Knight Thompson speech work have taken it one step forward with a list of things one should look for in the name of “vocal tract posture of an accent or dialect”. 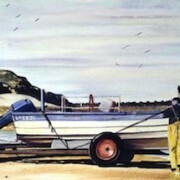 Check Dudley Knight’s “Speaking with skill”. In historical linguistics, there was a hypothesis about how languages differ. “Base of articulation” was postulated to account for differences. Sandra Disner from UCLA did research on “base of articulation”. Estill vocal technique (for singers) focus on developing kinesthesia for various muscles in the vocal box, so that they can bring in voice qualities like thin, slack, stiff, etc. The following site has a list of various voice qualities. Sound discrimination is an important skill; voice folks have never denied it. However, they have focussed more on the sound production–in terms of kinesthesia. What are you advising for voice/theatre folks? (c) or just allow those who have some innate ability (like that auditory cortex research you cite) to become future coaches/teachers? Thanks for reading, and for these stimulating questions. I certainly wouldn’t want to restrict coaching/teaching work to those who pass some genetic test! I imagine that those who gravitate to coaching tend to have some knack for it (though I’ve encountered one or two people who seemed to have acquired phonetics-teaching duties by drawing a short straw rather than out of special aptitude). Kinesthesia and sound discrimination are surely complementary; I make use of visual and kinesthetic techniques and didn’t mean to imply that I don’t. As coach Erik Singer says, “There are as many different styles of learning as there are learners. A one-size-fits all method of accent instruction will inevitably fail a large number of would-be accent learners.” And the goals of, say, an L2 learner and a professional opera singer are vastly different: the former needs to perceive and produce a new set of contrasts, the latter is performing bodily feats which may well need specific proprioceptive monitoring completely outside my knowledge. Coaches may claim, and believe, that their methods focus “more” on production and kinesthesia, but I suspect that auditory work is inevitably the core. Surely it’s not unheard of for a performer to learn an unfamiliar accent by listening to models (such as the recordings on Paul Meier’s magnificent IDEA database), with little or no kinesthetic work. But how successfully can one learn an unfamiliar accent by following kinesthetic instructions without any audible models? Both are important, but the invisible, implicit auditory-acoustic core sometimes seems to get second billing below what is more obvious to vision and touch. Great post! You’re on a roll, with these last two posts. Delightful. I’m afraid that many in the actor-accent coaching world don’t know how to use acoustic tools like Praat effectively for “measurement” purposes, but I KNOW that we would love to learn. Next year the Voice and Speech Trainers Association conference will be in London. Maybe you could run a workshop on acoustic phonetic basics for theatre voice professionals just before or just after the conference (maybe even PART of the conference?) to teach these skills. I bet you would get a lot of takers for that. I would be at the front of the line! From my experience, the ability to not only assess the speech of people working on an accent but (in my mind, more importantly) to be able to model the target speech requires a combination of articulatory self-knowledge and acoustic knowledge. Phil Thompson likes to say that we learn to “hear with our mouths”, that it is more difficult to perceive a new sound that you cannot make than one you can make (though not impossible as you argue well above). To me, it’s a blend of kinesthetic and auditory skills that is most important; I don’t really care which comes first. I’m not certain that acoustic features are that easy to talk about, unfortunately. The quality associated with rounded vowels vs. unrounded ones… how would you describe that? Your colour metaphor in your “vowel-space” post is helpful, but it is not a direct connection to the quality we hear. I can’t imagine saying “that needs to be more magenta!” to a client. I often find myself using terms like “brighter” and “darker” (not to be confused with the terms some people use for /l/, “dark” and “clear/light”!) and always find these adjectives sorely wanting. Are there other words that one might use? That sounds “lower-third-formantier” really doesn’t seem to capture it! I think I’ve learned to identify that auditory quality associated with velarization from practicing velarization a lot—and knowing the kinesthetic property has helped me learn to hear it and identify it. Diagnostic skill, to my mind, often comes from asking yourself “what would I have to do to sound like that?” With a thorough knowledge of what your articulators can do, and the acoustic qualities associated with those actions, you can figure it out. Is there really a way to be diagnostic without knowing how to do it? And by knowing how to do it, one then has ideas how that other action might move to a preferred action (as in work with disordered speech or coaching an actor to do a new accent). I often find myself using terms like “brighter” and “darker” … and always find these adjectives sorely wanting. Incidentally, bright and dark are two obsolete terms for “front” and “back” (vowels); they survive in English historical phonology, in fossilised names like Anglo-Frisian Brightening. Is that what you use them for? If yes, then there might be something that strikes the right chord on the auditory and/or cognitive end of the chain. Thanks Eric, your kind words are really appreciated. Sorry to take so long to reply but it turned out to be quite time consuming to make the blog’s audio materials mobile-friendlier, as you requested, which I hope they now are. But I think it’s worth distinguishing substance from presentation. Teachers/coaches may express themselves in articulatory vocabulary, and may claim and sincerely believe that teaching/coaching is about “structuring the muscles differently” or the like – and they may get excellent results – but the inevitable reality is that auditory demonstration is central and vital. You only have to think of the challenges of teaching speech to the deaf to realize that sound, though invisible and under-acknowledged by some musculocentric coaches, is the heart of the matter. Another point is that some in the English-speaking actor-accent world may have their conception of ‘speech’ skewed by anglocentricity. English has many vowels, and native speakers grow up exposed to many different accents: so anglophones have, as a starting point, a rich perceptual palette of vowel distinctions. A coach working with anglophone actors can push them between one auditorily ‘known’ quality and another (and may use terminology about the tongue to reinforce this). But if the starting-point is a Spanish speaker with only five vowels, it’s less easy to teach, say, the difference between a close-mid and an open-mid back vowel by giving precise instructions about the height of the back of the tongue. Performers, of course, are ‘transmitting’ more than they’re ‘receiving’. The actor has to sound like someone else, but doesn’t need to perceive like someone else. But in the language-learning world, students have to be able to hear contrasts as well as make them. Even if one manages to give articulatory instructions which elicit the right sound from a learner, there’s no guarantee that the same learner will perceive it correctly. I’m not certain that acoustic features are that easy to talk about, unfortunately. The quality associated with rounded vowels vs. unrounded ones… how would you describe that? The example you give, rounding, lends itself to articulatory teaching: as I pointed out in the post, the lips are visible and rich in touch receptors. But which articulatory features does one use to teach vowel length? Or stress and rhythm? Or intonation? There could be a danger that those who focus on the articulators may sideline many crucial speech skills. North Americans can’t do a British accent without nailing the short-long vowel contrast (and vice versa). Intonation is vital for the anglophone actor aiming at countless accents – north/south Irish, Italian, Russian, etc. You need the right rhythm e.g. for a French or Spanish accent. And so on. At least one speech text for actors has practically nothing to say about these areas – maybe because they can’t be tied to some readily visible, feelable bit of the anatomy.